Loved #ROHWoolf even more this year. Parts 1 & 3 full of pain, feeling, humanity & part 2 just a fabulous barnstormer. Ferri is a legend. What did you think of Woolf Works? Add your reaction in the comments. Woolf Works runs from 21 January – 14 February 2017. Tickets are still available. This production is given with generous philanthropic support from The Tsukanov Family Foundation. As wonderful as I remembered from 2015. Parts 1 & 3 moving to the point of pain. Part 2 even more enjoyable as I get it for the amazing romp it is. Feel privileged to have seen it. The greatest artwork I have ever experienced and, like Nick Byrne, even better than my memory of the first run. I saw it twice first time around, and twice on Saturday. It seems unfair to single people out but I thought Matthew Ball and Yasmine Naghdi were sublime in Act I of the matinée - indeed, I felt I couldn't move from my seat for a good ten minutes at the end of Act I, and would have welcomed a dark, quiet room to further reflect on what I had just seen and felt I had been involved with. Come the evening performance, Alessandra Ferri was simply exquisite; Natalia Osipova so powerful; the entire cast entirely warranted the standing ovation. And now I look forward to a further three performances - a thing I have never before been tempted to do but I am almost wondering just how I will survive after the final night. Congratulations and many thanks to everyone involved for making such a profoundly moving work of art. Is there any reason why Matthew Ball who is apparently dancing Septimus in the second cast does not get a mention in the cast list? Thanks for noticing this and for flagging to us. This error has now been corrected. This is a stunning work that has so many layers of meaning, and somehow manages to be subtle, riotous, nuanced and expressionist, all at the same time. It combines the very detailed and intimate with the grand and extrovert. I loved it in 2015, when I knew nothing about Virginia Woolf. Since then I have read and learnt much about Woolf's work (as it were), and found many more levels of meaning as a result. I agree with Nick that, like all great works of art, this is a ballet that will force you to reflect afterwards on many different aspects of life and existence. (I had to sit in Balthazar rather stunned for a good half hour after the performance finished). 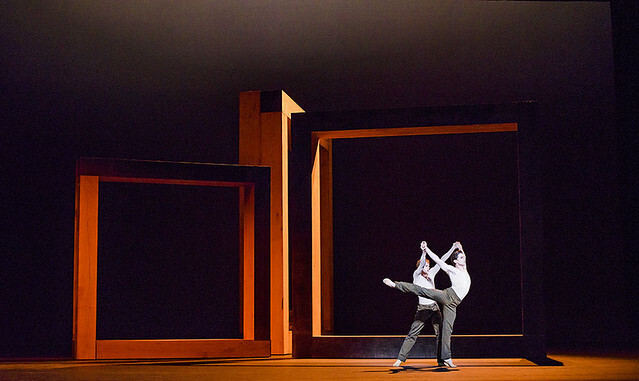 This ballet really is a gift from Wayne McGregor - it is visually stunning, deeply moving, and intellectually stimulating: you are both inside and outside of the mind of Woolf. While I have really enjoyed Wayne's one act works (Multiverse and Obsidian Tear particularly), the full length ballet feels like something that really allows him space to develop and explore fully themes and subjects, and takes his work to a different level altogether. This is a very mature work. Very much looking forward to seeing this again later in the run, and hopefully more full length ballets from Wayne and his team. James Joyce, anyone? Saw Woolf Works today. Absolutely fabulous. Totally spellbound. Another performance from the Royal Ballet with amplified (indeed over-amplified) music. Am I the only person who finds this unacceptable? I love the amplified music! I find it immersive and I get more into the experience. Saw streamed version of Woolf Works yesterday evening. I was part of a 'Sleeping Beauty' kind of audience I think; lots of muttering about not understanding the programme notes and 'should have read up' on Woolf beforehand . Thankfully, everyone riveted by the intensity of the dance and music. I really admired the physicality of the movements and the flow between solos, duets,trios, quartets and ensemble dances. Personally, I was more immersed in Part 1 and Part 3 because the emotionality felt true. Orlando did not have sufficent structure. The 'futuristic' look of the costumes and and the 'futuristic' sounds of the music at times was a little bit too Flash Gordon for me. Please put this on dvd. I bought the cd of the music, but no cinemas near me in the US had the live broadcast. I buy all your dvds when you release them...please let me add this one to my collection. I’m happy to announce that there are plans to make a Woolf Works DVD, although we don’t have a release date yet. Our international distributors continue trying to increase the number of cinemas showing our content in the US. Hopefully there'll be a cinema near you soon. Delighted to hear - from the response to this enquiry - that there is to be a DVD. I saw the live stream on Wednesday and still thinking about Woolf Works today. I don't normally use language like this but I can't think of any more suitable words other than devastatingly splendid to begin to describe it. Thank you to all the many talented people involved in this production. Brilliant all the way through. Thank you. Woolf Works ballet choreographed by genius of nowadays Wayne McGregor takes us beyond this universe to paralleled word of anormous imagination of emotions and feelings which everyone is left with their soul to look on them self. Use of dance emalgameted with beautiful music, lights and scenography gives us emotions out of this world, takes us beyond by presenting in front on our very eyes butiful journey through pages of Virginal Woolf'f books, her mind and our emotions. This is the biggest and most important ballet of XXI century and I'm so happy to be a humble witness of this miracle. Absolutely loved the production, the choreography, the music, staging, costumes... it was so interesting, moving, joyful. I came with my daughters and it is something we will remember and talk about for ages. Inspiring. Seen for the fourth time on the Sat11th Feb matinee. Still exhausted today - the nuances have so many more resonances and greater depth on each viewing. A masterpiece for all involved. Question: Is there to be sheet music released (ideally for piano) - I would love to play many of the beautiful pieces, and it would also be wonderful for my violinist son to duet with me. One more question - could you kindly tell me about Vassiliev's violin - hearing him live is astounding and always reduces my husband and myself to tears that any sound so beautiful can be produced. Thanks to all concerned, a triumph. Mara Galeazzi was sublime in Woolf Works last night. We've been lucky to see both her and Alessandra Ferri in this role. It's Wayne McGregor's best work by some distance - can't wait to see it again. Even now - weeks later - I keep thinking about Woolf Works..... mesmerising music and dance. Beautiful. I listen to the cd a lot.... very happy to read you are bringing out a DVD.... how will we know when it becomes available? And do you have any plans to stage the production again? Very glad to hear you enjoyed Woolf Works so much. Details of the upcoming Season are always announced in April and we'll post DVD releases on our social media channels as and when, so do keep an eye on them for further updates. Have just watched the performance on BBC4. Liked Part One, Mrs Dalloway, best. Pleased to see that the whole Corps de Ballet was actively involved, but it was difficult to concentrate on individual performances. However, what a privilege and pleasure to see that great ballerina Alessandra Ferri again (surely the best Juliette of her generation). I think it's outrageous that the final credits whisked past at such a speed that nobody could read any of the names. Surely Principal and Soloists deserve more respect and should have been highlighted. Saw it in 2015 but regrettably missed it last year. Had a visceral reaction to Part Two - the vibrancy of movement, costumes and sound brought me to tears by the end. Would love to see it again, taking along a numbers of friends, so am constantly checking ROH’s schedule and I pray it will be in next year’s.